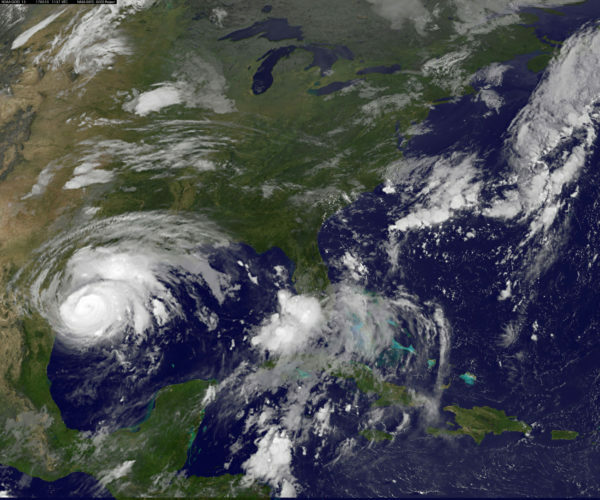 Hurricane Harvey is seen approaching the Texas Gulf Coast in this NOAA GOES East satellite image. CORPUS CHRISTI, Texas – Residents of the Gulf Coast hunkered down late Friday amid dire warnings of a major natural disaster as Hurricane Harvey roared ashore as a Category 4 storm with 130 mph winds for a few hours before weakening as it slowly moved inland. The National Hurricane Center reported at 10 p.m. Central time that the center of the eye of the cyclone had just crossed the Texas shoreline over the northern end of a barrier island about four miles east of the city of Rockport. But weather officials on Saturday had downgraded Harvey to Category 1 by 5 a.m. Central time, with maximum sustained winds of 90 mph. When it made landfall hours earlier, Harvey easily was the strongest hurricane to hit the United States since Charley in 2004 and the first Category 3 or greater storm (winds of 111 mph or higher) since Wilma in 2005. Forecasters and government officials, scrambling to deal with a storm that popped up this week after being a mere tropical depression in the western Gulf of Mexico, warned of catastrophic flooding, ferocious winds and a storm surge that could reach 12 feet. Some locations in southeast Texas had already reported 16 inches of rain by 5 a.m. Central time, said the National Weather Service, which predicted total rain accumulations of 15 inches to 30 inches in many areas, and as much as 40 inches in isolated areas. Initial reports compiled by the National Weather Service said numerous structures in Rockport had been “destroyed” and described “buildings collapsed with people trapped inside.” But those early reports, distributed on social media, remained sketchy as the storm raged into the middle of the night. Rockport city manager Kevin Carruth said multiple people were taken to the county’s jail for assessment and treatment after the roof of a senior housing complex collapsed, according to the Associated Press. Carruth also said that Rockport’s historic downtown area has seen extensive damage, AP reported. About 10 people in Rockport have been treated for injuries suffered during the hurricane, KIII-TV reported. Earlier Friday, Rockport Mayor Pro Tem Patrick Rios told the TV station that those who chose to stay put “should make some type of preparation to mark their arm with a Sharpie pen,” implying doing so would make it easier for rescuers to identify them. Here in Corpus Christi, a city of 320,000 people, lights flickered downtown, where many locals, out-of-town journalists and storm chasers had taken refuge in hotels. Local media reported roofs blown off homes. Soon after the outer bands of Harvey reached the South Texas coast, Gov. Greg Abbott, R, on Friday afternoon urged citizens to evacuate low-lying and coastal areas immediately. President Trump said Friday night that he has signed a disaster proclamation in Texas after Abbott sent him a written request. White House aides said that Trump would visit Texas next week. Several hundred miles of the Texas Gulf Coast are under hurricane and storm-surge warnings. Harvey is expected to stall over the coast and could even drift back out over open water, drawing fresh energy from the warm gulf waters before meandering ashore again closer to Galveston. That scenario would deliver historic amounts of rain to the region, with some models showing accumulations in feet rather than inches. Flooding is likely in and around Houston. Thousands of people were reportedly stuck on cruise ships in the gulf and unable to enter the closed Port of Galveston as the winds picked up. The American Red Cross mobilized staffers from across the country. Paul I. Carden Jr., regional disaster officer for the Red Cross’s National Capital Region in Washington, said in Corpus Christi that residents are foolish if they decide not to evacuate. After the storm, the Red Cross will be providing cleanup kits, health and mental-health professionals, and spiritual-care workers to help residents cope, he said. A steady and orderly stream of traffic flowed out of Corpus Christi, heading for higher ground. But many thousands decided to ride out the storm. Now they’re in the path of Harvey. They fled the boat early Friday and checked into the Holiday Inn downtown. The hotel has become a refuge for stranded tourists, boaters, storm chasers and journalists. But Sweeney, 70, is worried about the hotel, which is surrounded by skyscrapers. At the small rural shrine to Don Pedrito Jaramillo, a revered Mexican American folk saint who died in 1907, believers filed in to ask for protection from the storm. Jaramillo, a native of Guadalajara, Mexico, had a reputation for healing in a time and place where few people had access to conventional medical care. Aurora Zapata, 42, a homemaker, and her daughter, Dina Zapata, 12, both of Falfurrias, were lighting candles at the shrine Friday afternoon as the first bands of rain began to make landfall. “We are just praying to Don Pedrito to protect us, our whole family and our town from this hurricane,” Aurora Zapata said.